Everyone loves a good bracket, especially blog readers. It seems like there have been tons of different faux-tourneys done, whether it be to see who's the hottest chick, to who's the biggest douchebag. 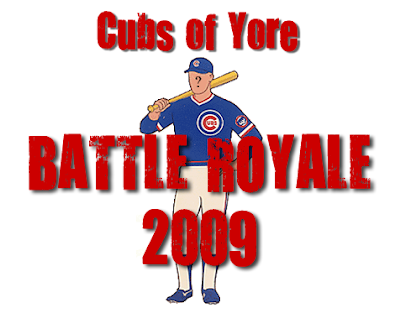 So I figured it was time TMS beat this idea even further to death with the "Cubs of Yore Battle Royale." A field of 32 former Cubs battling it out for the top crown*. 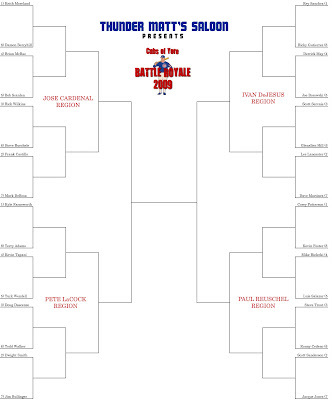 In an effort to prevent the obvious candidates like Ernie Banks and Ryne Sandberg from making the finals I've decided to make it more interesting. Instead of having all the Cubs legends battle it out, we're featuring the unsung heroes. The guys that never earned any accolades in their playing career. The guys that when their name comes up in conversation never have the words "All-Star" or "Hall of Famer" been mentioned, but rather words like "scrappy", "cult following", "workhorse" and "innings-eater" instead. The guys that probably weren't as good, or as crappy as you remember them. So the field of 32 was mainly picked based on some loose criteria rules I came up with. The player had to be a main starter for the Cubs in at least one season since 1984. The player cannot have won any real accolades of note, including ASG appearances. The player cannot be on the current Cubs roster. The first round will begin on Monday and the whole battle will go through the month of May. I'll have polls posted for each battle, probably in the sidebar for a couple days. Q: I can't believe you didn't include ________________! What the hell? A: Calm down. I can't include every damn player, so some were left out. If this thing is successful I have a plan to maybe make this an annual thing where we change up the players a bit each time. Q: This seems a bit obvious, but why no Thunder Matt? A: For all intents and purposes, Thunder Matt Murton would qualify for this under my loose criteria. However there's just too much conflict of interest to have him here. Q: This sounds great. Will you just show us the damn bracket already? A: Yeah, here it is. Check back on Monday. Click to enlarge, like my pe-, eh that joke is worn out....like your mom last night, natch! *I'm not sure what exactly said "crown" could be.